I was hoping you could help me find information about my grandfather’s archtop guitar, a “KlearTone Jewel.” I would like to do some work on it to make it playable but need to make sure that it doesn’t have any collector value first! There isn’t anything printed on the inside or outside to identify this guitar and I cannot find any information elsewhere. The top is laminated, and the headpiece has a “KlearTone Jewel” graphic stuck on. I’m not sure what is more intriguing – the guitar or the cool Coke blanket! In the guitar business, we would refer to “KlearTone” as a house brand. House brand guitars were typically built by a large guitar company and branded with another name. This happened quite often with mail order catalogs between the 1920s and the 1960s, where they would have guitar companies build guitars and other instruments under their own name (think Silvertone guitars built by Danelectro for the Sears & Roebuck Company). KlearTone guitars were actually built by some of the larger guitar manufacturers during the 1920s and 1930s including Regal, Gibson, Kay, and Harmony. Most KlearTone instruments are acoustic archtops, but other variations exist as well, and they were distributed by Grossman Brothers of Cleveland, OH. Your guitar is a fine example of their acoustic archtop line with a fancy headstock. 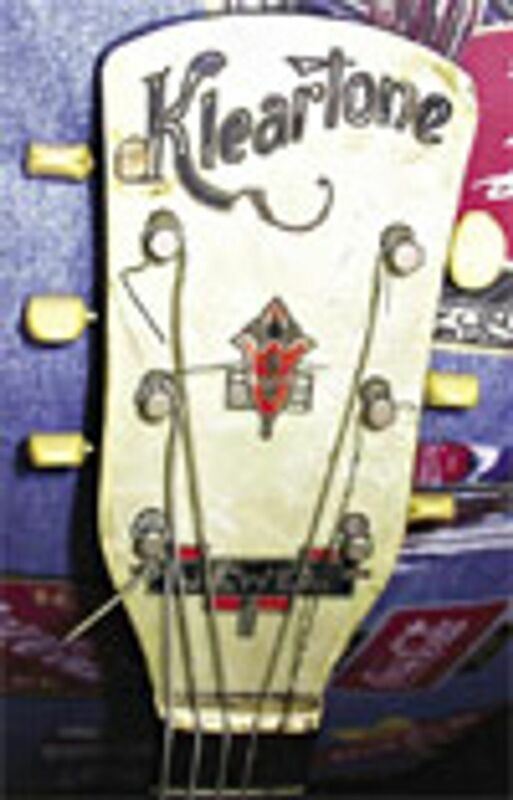 KlearTones are known for their ornate headstocks and misspelled name (Cleartone vs. KlearTone). Like many house brand instruments, specifications about these guitars are very limited. Since some of these instruments were built by Gibson (and there is a chance yours was), select KlearTones are desirable. It seems any guitar built or associated with Gibson is worth a premium these days. Regardless, I’ve seen these guitars sell from anywhere between $50 and $1,000. Your model appears to be pretty clean, and aside from a good cleaning, restringing, and set up, it is ready to go. I would value your guitar between $500 and $800, but a lot of that depends on if Gibson made it or not. If it was built by Regal, Harmony, or Kay it would be worth less. This guitar may not be the treasure you are looking for, but it has quite a bit of potential as a player. For more information on house brands, refer to the Blue Book of Acoustic Guitars. I’ve had quite a few inquires about identifying and evaluating guitars. Next month, I’m going to start a series of articles dedicated to how to correctly identify and assess your guitar – in other words, determine if it is Trash or Treasure! Also, if you have a certain guitar or manufacturer that you are looking for information on, do not hesitate to contact me – I’ll see what I can dig up!